Chicken is a weeknight staple - but does not need to be ordinary. Why not dress it up with a simple but super sauce? 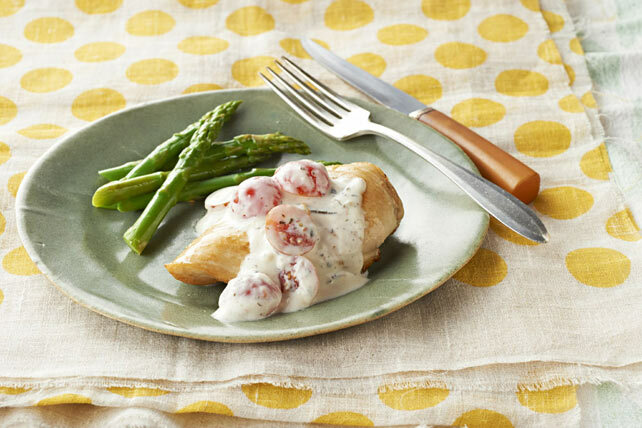 Try this easy chicken skillet topped with a creamy tomato-herb sauce for a twist. Heat oil in large nonstick skillet on medium-high heat. Add chicken; cook 6 to 7 min. on each side or until done (165ºF). Transfer to plate; cover to keep warm. Add cream cheese product and water to skillet; cook and stir 2 to 3 min. or until cream cheese is completely melted and sauce is heated through. Add tomatoes; cook and stir 2 min. Serve with steamed broccoli or green beans, or a mixed green salad tossed with your favourite Kraft Dressing. Prepare using Philadelphia Chive & Onion Light Cream Cheese Product. For added colour and flavour, garnish with 1 Tbsp. chopped fresh parsley, basil, dill, tarragon or chives before serving.